Climate change, energy sources, natural disasters: These themes are the focus of an upcoming international conference in Munich on the history of humankind’s relationship with the natural environment. 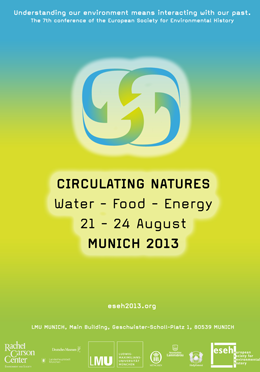 The world’s largest environmental history conference takes place from 21-24 August in Munich. The conference has been organized by the Rachel Carson Center for Environment and Society (RCC) at LMU. In addition to the central themes expressed in the overarching theme of the conference, “Circulating Natures: Water – Food – Energy”, other topics of discussion will include climate change, conservation and the history of environmentalism. “The term ‘Circulating Natures’ is intended to stress the fact that no environmental phenomenon can be properly understood when viewed in isolation, because this ignores the highly interlinked nature of environmental processes. We therefore adopt the historical perspective, which reveals that every change and every human intervention in natural processes has long-term effects,” says Christof Mauch, Professor of American Cultural History at LMU and Director of the RCC. More than 600 specialists from all over the world are expected to attend the interdisciplinary event. One of the plenary sessions will take the form of a public lecture by the American nutritionist and public health expert Marion Nestle. The lecture will be given in the Great Aula of the LMU Main Building at 7pm on 23 August, and admission is free. In addition, members of the public may attend all the formal sessions of the conference upon payment of a modest registration fee. The interdisciplinary Rachel Carson Center at LMU is one of the world’s largest centers for environmental research where environmental issues are studied from the perspective of the humanities and social sciences.